Main stay of any education institute is research. RGI gives lots of encouragement to conduction of research in new emerging areas of science and engineering. We believe that as teacher gain more and more knowledge through research, quality of his teaching will be better and better. 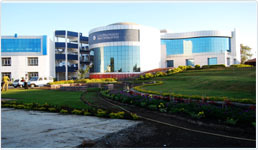 All departments conducting PG programs have research labs, where access to latest journals, collection of test data and tools for simulation and modeling, performance checking, generating variety of inputs and at different rates, tools for analysis, facilities to meter all the important parameters and performance etc are kept ready. For an individual researcher there is no need to run pillar to post to acquire matters related with research. Not only senior persons are always available to not only guide and mentor but also to teach as how to use different tools and metering facilities. RGI has signed MOUs with other industry and institutes for mutual cooperation for R & D and exchange of information. The quality and number of publications are excellent. Direct beneficiaries are students who are able to do quality project work and complete their UG PG thesis in time. Several externally sponsored and funded projects are in progress. There is in house R&D budget allocated to all the programs. RGI publishes a research journal “RGI International Journal of Science & Engineering”, duly registered with Publication Department GOI. ISSN No. 2230-939X. A monthly news letter “Campus Meter”, also carries various R & D efforts.